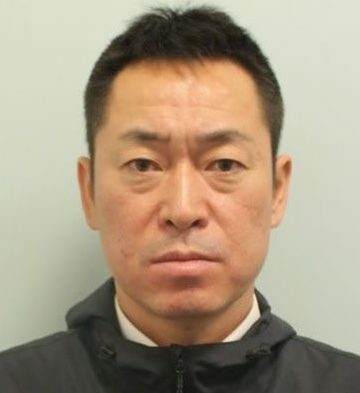 A Japanese pilot who was almost 10 times over the alcohol limit when he staggered into the cockpit on a flight from Heathrow Airport has been jailed. Katsutoshi Jitsukawa, 42 risked hundreds of lives after going on a bender the day before the flight. He was detained by police at the controls of a Boeing 777 just 50 minutes before the Japan Airlines (JAL) flight JL44 to Tokyo was set to take off at 7pm. Security staff had noticed that the pilot seemed drunk when he was being bused to the aircraft. The security manager boarded the plane and was told that Jitsukawa was in the cockpit of the flight deck. The Japanese airline station manager collected Jitsukawa from the flight deck and brought him to the security manager. Jitsukawa confessed said he had drunk whiskey the night before and was told he would be breathalysed. He then said he needed to get his blazer and went to the toilet where he desperately gargled with mouthwash. Douglas Adams, prosecuting, said: ‘He said he needed his blazer. ‘He asked if he could go back to get it. ‘The security manager saw him in the toilet rinsing and gargling his mouth with mouthwash. When the police arrived after 40 minutes it was noticed the pilot still smelt of alcohol the pilot was physically swaying. He was breathalysed and failed the test. A blood sample showed he was at least nine times over the limit for those who are about to perform an aviation related function. He was arrested by police as the flight was delayed by over and hour. The plane eventually had to take off with two pilots rather than the normal three. Tests revealed Jitsukawa he had 189mg of alcohol per 100ml of blood in his system. He plead guilty to exceeding the alcohol limit at Uxbridge Magistrates Court. The limit for a pilot is 20mg, around one tenth the amount in Jitsukawa’s bloodstream. The pilot appeared via video-link from Wandsworth Prison wearing a grey prison-issue tracksuit. Jitsukawa hung his head in shame as Bill Emlyn-Jones, defending told the court: ‘Mr Jitsukawa appears before this court in a state of absolute disgrace. He said that Jitsukawa experienced loneliness and insomnia due to his work as a pilot and found his experience of British prison ‘utterly bewildering’. Jitsukawa is the sole carer for three children, aged three, six, and eight. Judge Philip Matthews told him: ‘You are an experienced pilot. ‘But you had clearly been drinking over a long period up to a time shortly before you were due to get on the plane. ‘You were one of the three crew members on the flight deck. ‘You would have remained over the relevant limit for many hours to come. ‘The reading makes clear that you had been drinking during the day before take-off. ‘The prospect of you taking control of that aircraft is to appalling to contemplate. ‘The potential consequences for those on board was catastrophic. ‘You compromised the integrity of the other two members of the flight team. Judge Matthews added:’ If repatriation is possible in your case then the court will welcome it always provided that the full rigour of the sentence is passed and is not dissipated. Jitsukawa admitted one charge of performing aviation when ability impaired due to proportion of alcohol in breath/blood/urine. He was jailed for 10 months.